Sea urchins are shellfish, are able to move slowly on hard surfaces. As a rule, they attach themselves to underwater stones. Hunting them is carried out quite simply by diving at a shallow depth, and scraping them with a knife from the surface of the stones. Of course, you can use this to catch fish for cooking, however, most useful and correctly to eat sea urchins raw. Sea urchins, which are edible, usually have a small accumulation of algae attached to their upper part. They also should never be black: choose clams with slight hints of red, green, or purple. Despite common misconceptions, sea urchins are not dangerous. Of course, their spines can inflict a painful wound when they puncture the skin, but these injuries only happen in the case they inadvertently take his hands. Pulling shellfish out of the water, it is advisable to use plastic bags. The perfect capacity for catch is the volumetric plastic bucket with a small amount of water. This will allow sea urchins for a long time to stay alive and fit for consumption. Trying to open freshly caught prey with scissors or any other improvised means, most likely, will not succeed, and could result in serious injury. For this purpose it is necessary to use a very sharp knife or a special device (which is pretty cheap). Cut the clam in half (if you use a sharp knife) or open it with a special device. Be careful – the liquid contents can flow out. 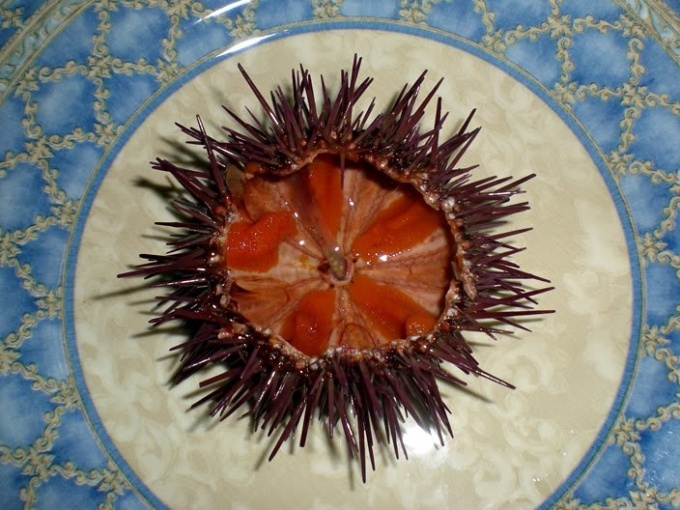 Speaking about how eating a sea urchin, remember that edible part is the ROE and gonads. Carefully rinse the opened clam a small amount of water. This will allow you to wash the intestines and other inedible parts. After washing should be visible clean orange-brown inside. You can now move on to the food, scooping out the inside of the clam with a teaspoon. Raw sea urchins are eaten in its natural form, without any additives. The eggs of the mollusk is easily separated from the other viscera. After the use of sea urchins as food you can use their shell for decorative purposes. We need a good rinse and dry it and then regain its original shape with glue or wax. If you don't like the smell of the insides, you can add a few teaspoons of liqueur or sake and stir everything until smooth. Sea urchin ROE is a famous Japanese snack. You can cook sashimi (filed on the plate raw with a side dish of vegetables) or pickle for salads and sandwiches. You can also cook variety of dishes of sea urchin, for example, sauce for pasta or steamed vegetables.